Have you ever wanted to be president? or prime-minister? Convinced you could do a better job of running the country? Let's face it, you could hardly do a worse job than our current political leaders. Crime, Unemployment, National Debt, Terrorism, Climate Change... Have you got the answers to the problems that face western industrialized nations? 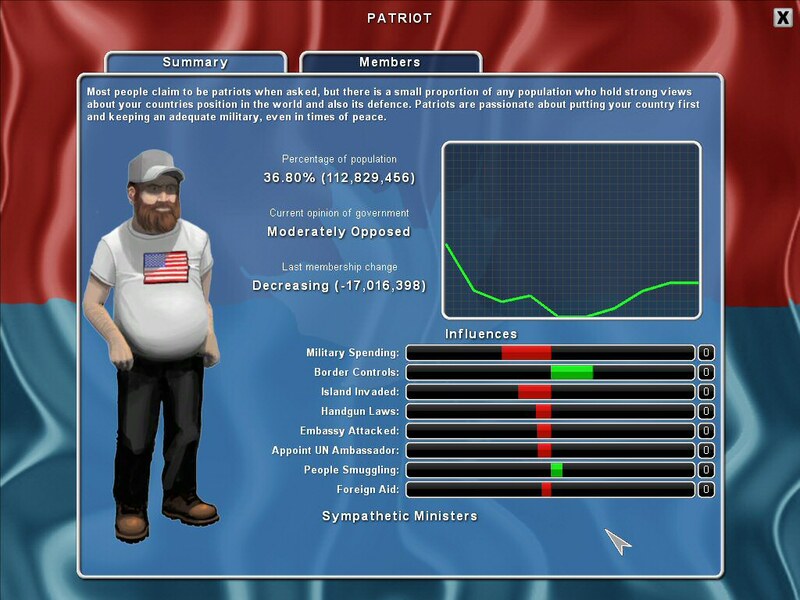 Democracy 2 is the ultimate political strategy / simulation game. The game simulates the motivations, loyalties and desires of everyone in the country. As president or prime minister, it's your job to balance the need for income from taxes against the demands of the voters. Do you want your country to be an eco-friendly green paradise? or a capitalist utopia? Will you pander to the patriots, the liberals or the religious pressure groups? 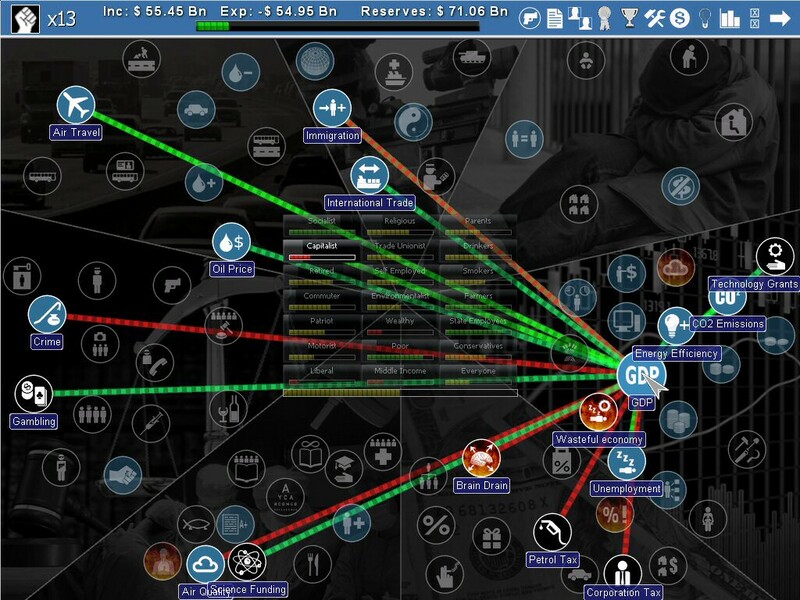 Can you keep crime under control without destroying the civil liberties of your citizens? And can you keep good diplomatic relations with other nation states? This popular pc strategy game is easy to pick up. An innovative user-interface shows the relationships between everything in the game just by hovering your mouse over an object. The game is 'turn based', so it's the ideal game for those who prefer an intelligent, thoughtful game. The key to the game are the policy 'sliders' that let you adjust how your government runs. You can raise or lower taxes with a slider, or even adjust education policy, or workers rights in exactly the same way. This system makes for a game that is easy to learn and difficult to master. 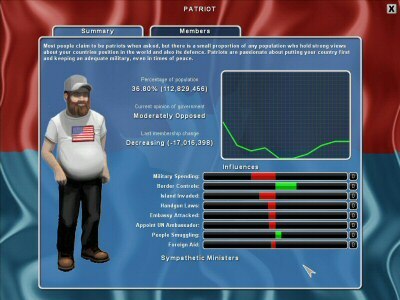 Democracy 2 covers the whole range of political opinion and policy, from debates over stem cell research and school prayer, through the provision of state health care and benefit payments to the unemployed, right across to tax shelters for the wealthy, the death penalty, military spending and civil rights. regardless of where you stand on political topics, you will have the option to take control of the political machine and put your ideology to the test. 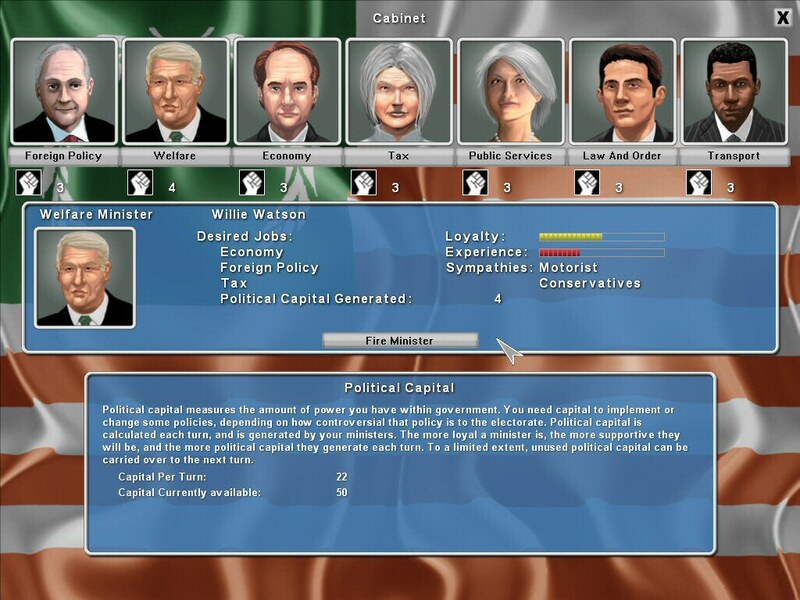 Democracy 2 isn't just an election game, but focuses more on simulating the actual running of a country. Your party will need to keep the voters happy to re-elect you, but it's the actual day-to-day decision making as president or prime minister that is the core of the game. 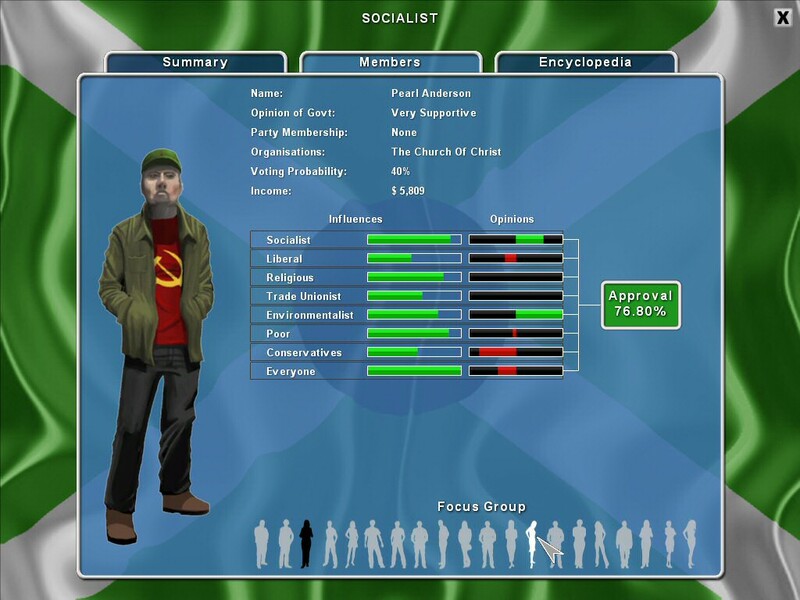 It's this that makes democracy 2 the most original politics game you can play. The game is a turn-based strategy game. 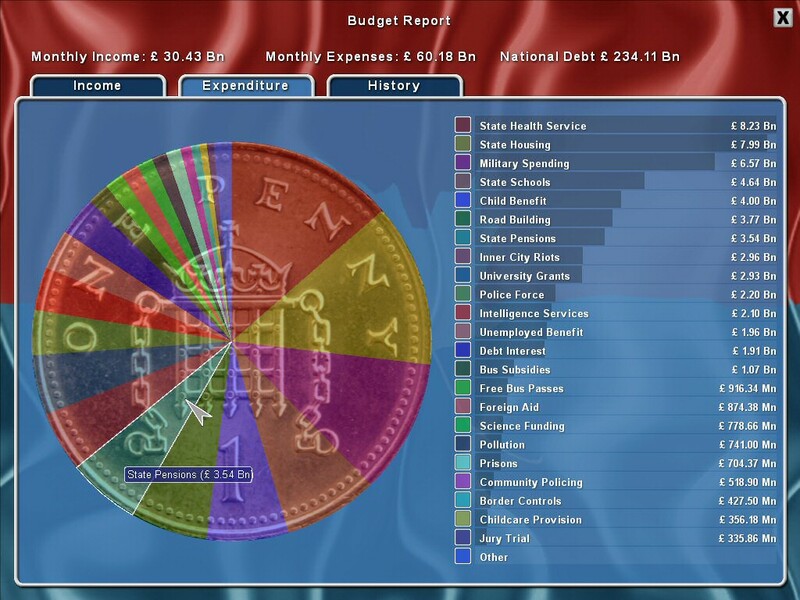 Each turn represents a few months in office and you have a finite amount of 'political capital' to spend each turn. You can use that capital to introduce new laws, change department budgets, or make changes to existing government policies. 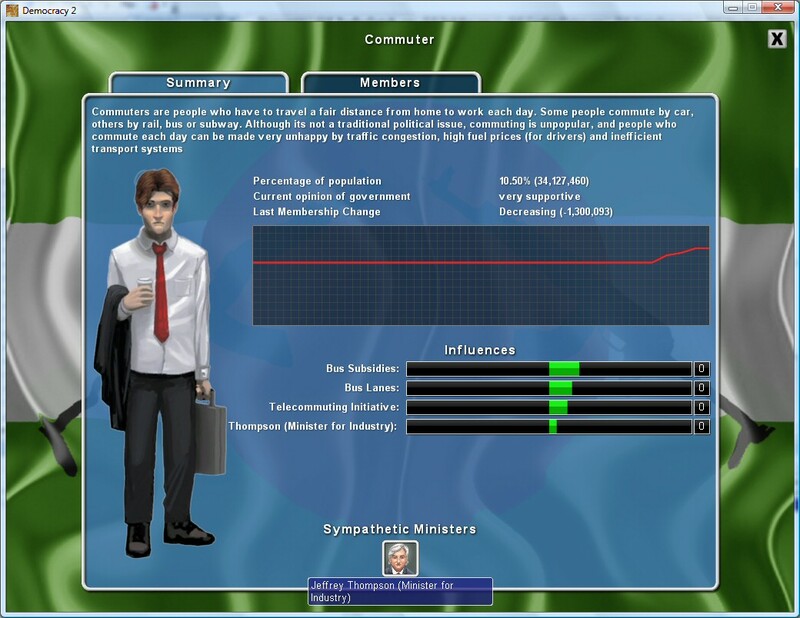 Democracy 2 is your very own virtual government, waiting for you to take control. Democracy 2 comes with 10 different nation states for you to play as elected ruler, and it's easy for you to mod your own countries. 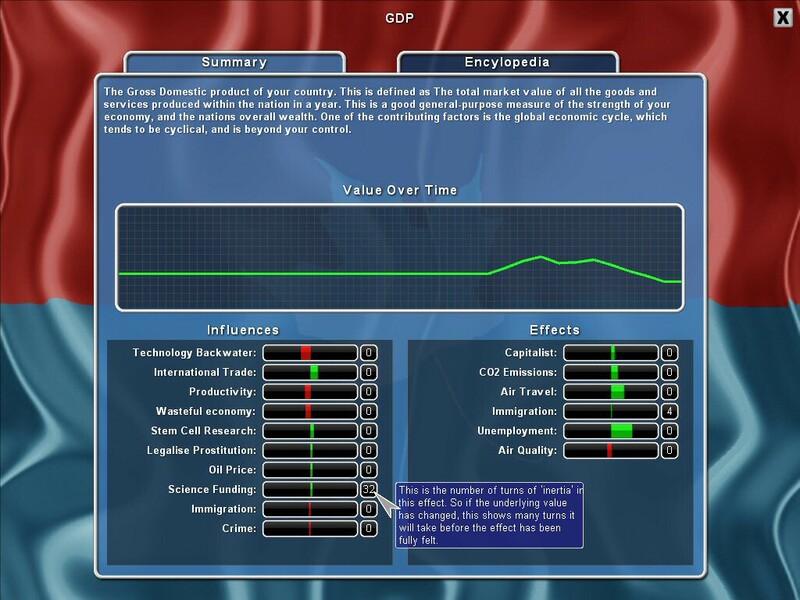 You can also adjust a whole range of parameters at the start of each game, such as the length of time between elections, the political party names, and the distribution of citizens between various electoral groups. 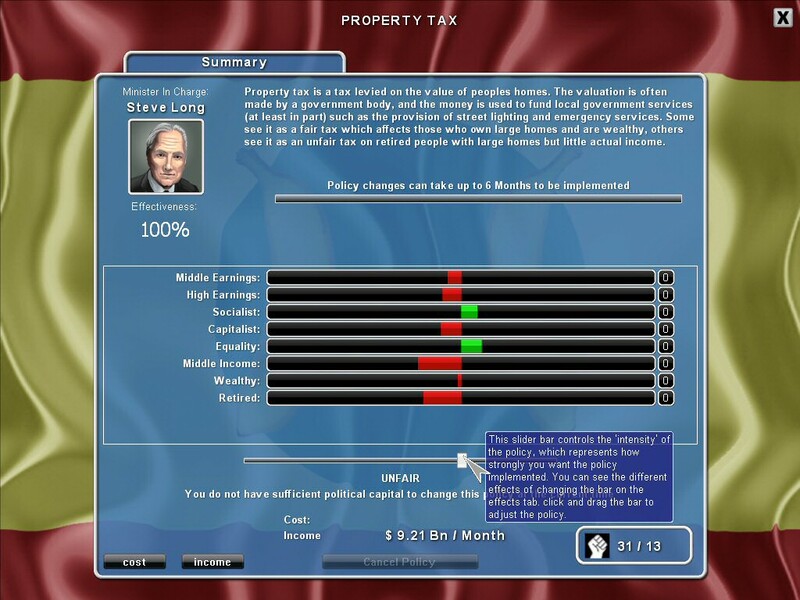 The game also has a number of achievements to work towards such as Economic Miracle or Crime-Free utopia!. You can limit the number of terms too, if you don't relish the prospect of staying president forever. What are you waiting for? try the free demo.